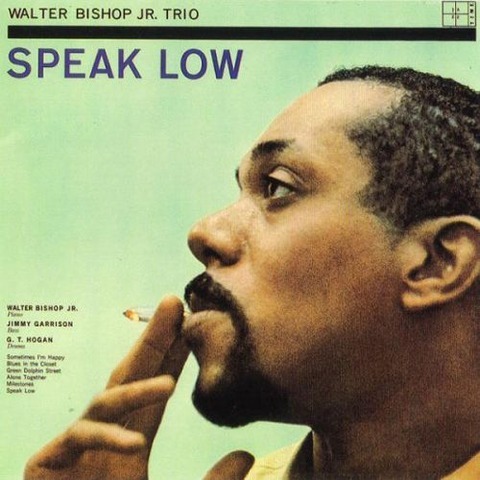 Prove me wrong, but it’s hard to find a better album in the career of pianist Walter Bishop Jr. than his debut as a leader from 1961, Speak Low. It sure is rated as a classic. The Popsike website lists triple-digit transactions, climaxing in a 2016 eBay transaction of a wopping 2000 US $. Prices presumably are high because of the obscure label, early catalogue nr, (002) and scarcity of supply. May be so. The vinyl world has gone berserk. Money is what makes the world go ‘round. I do hope the buyer keeps his scraggly Chihuahua in a standing and not a sitting-and-shitting position. Might just ruin a solid investment. Speaks for itself, neither a Chihuahua, nor the vinyl copy of this album is in my possession. I’m a cat man in jazz cat’s world. Bishop Jr, born in Sugar Hill, Harlem NYC, home to his childhood pals Sonny Rollins, Art Taylor and Kenny Drew, bebop colleague of Charlie Parker and Miles Davis from 1951 to ’54, without a cabaret card in the late fifties due to a drug bust and as a consequence banned from New York clubs, resurfaced in the early sixties with a regular trio including Jimmy Garrison and C.T. Hogan. Whilst dedicating a lot of his time to teaching in the seventies and beyond, Bishop turned in a record every year in the seventies and kept recording and performing in the New York area until his demise in 1998. Perhaps best known as a sideman, and a brilliant one at that, Bishop Jr. appeared on, among other, Charlie Parker’s With Strings, Miles Davis’ Dig and Collector’s Items, Kenny Dorham’s Quintet and Inta Something, Blakey’s Blakey and Big Band, Milt Jackson’s Meets Milt, Hank Mobley’s 2nd Message, Jackie McLean’s Capuchin Swing and Swing Swang Swingin’. In this set of traditionals, the assets of Walter Bishop Jr. are laid out for our thorough enjoyment. Though firmly rooted in bebop, Bishop Jr. doesn’t strictly think in changes, but focuses on classy harmony as well. Throughout his carefully crafted solo’s, Bishop Jr. throws in charged cadenzas high up on the keys, sudden dissonant notes and tasteful bits of double time, occasionally ending with intricate chordal runs. It’s all there in the title track, Speak Low, listen here as well as the fast-paced Milestones (the Miles Davis composition), which also boasts Bishop’s Jr.’s precise, propulsive phrasing. Rollicking tremolos, recurring blues and stride figures reveal a genuine passion for the past. Every tune, especially the medium-tempo Alone Together, listen here tells a surprising story. He’s got a firm attack, like his mentor Bud Powell, in such a way that one often expects a key to jump merrily out of the keyboard. That’s another alluring asset of the masterful Walter Bishop Jr., who delivered a debut album that has gloriously stood the test of time. Posted in Review	- Tagged Jazztime, Walter Bishop Jr.